About an hour from the attractions area of Central Florida exists one of the most unique and beautiful theme parks in the world. This is, of course, LEGOLAND Florida. It’s in the middle of its second year and already expanded to include a water park and a Star Wars section. Coming soon is a huge new area of the park that will be unique to all LEGOLAND parks around the world. 2013 has a full line-up of action-packed fun with special events specifically geared towards families with children age 2 to 12. From LEGO® Friends Weekend to Kids’ New Year’s Eve, there is reason to return again and again to enjoy a full year of LEGOLAND® Florida’s special events and more than 50 rides, shows and attractions. Families will also enjoy more hours of interactive family-fun with extended daily operating hours for 2013, 9:30am — 6:00pm. During certain special events operating hours will be extended even further. This certainly addresses one of the biggest complaints about the park. The list of events is long, which are you planning to attend? Junior Master Model Builder is a fun and interactive LEGO® building competition that takes place quarterly. Guests are invited to participate and build a model that follows the designated LEGO theme for each competition. Quarterly winners receive special prizes and will be invited to participate in the Ultimate Build Off at the end of the year. LEGO® Friends Weekend ( February 9 and 10, 2013 ) is a daytime party for girls that includes a LEGO Friends building event, entertainment, games, activities, a chance to meet your favorite character and much more. This second annual event celebrates girls and their personal individuality, just like the LEGO Friends product line for girls. LEGOLAND Water Park, a park within a park, re-opens with a splash and just in time for spring break and summer-time fun. Guests of all ages can spend a full day of play in the water park with the Build-A-Raft River, where guests can build their own LEGO inner tubes and float down a 1,000-foot lazy river, the DUPLO® Splash Safari, the Joker Soaker water playground, a 583,000-gallon wave pool and five slippery-fast water slides. Opens March 9 and runs through the end of October. Winter Haven Hospital Foundation’s Citrus Classic 5K Run and Fun Walk* (April 6, 2013) allows runners and walkers to “play their part” during this community-wide health event designed for participants of all ages. Participants receive exclusive discounts for post-event park admission. 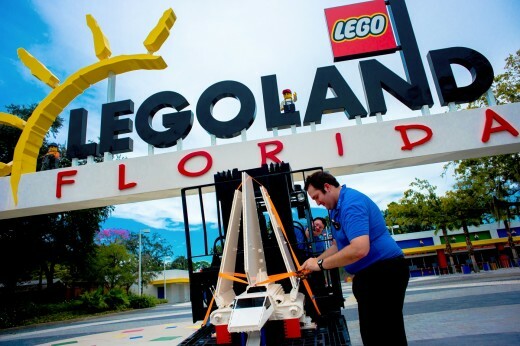 Visit www.legoland.com for event registration fees and processes. LEGO® Star Wars Days (May 4 and 5, 2013) is a thrilling event where guests will feel the power of the force. Celebrating all-things Star Wars, guests will enjoy reliving the Star Wars saga in the park’s newest expansion of Miniland USA where the six live-action Star Wars movies, as well as a scene from the animated series Star Wars: The Clone War are created of more than 1.5 million LEGO bricks. Guests will enjoy a Yoda Scavenger Hunt and a special LEGO Yoda build activity. Red, Brick & Boom ( July 4, 5 and 6, 2013 ) allows guests to celebrate the 4th of July with a bang at this second annual Independence Day event. With special viewing glasses that turn ordinary fireworks into millions of exploding bricks, this July 4th celebration is sure to dazzle and delight with three nights of family fun and fireworks. Brick-or-Treat ( Weekends in October 2013 ) offers safe and family-friendly Halloween festivities every Saturday and Sunday in October. This spooky, kooky event features a Haunted Scavenger Hunt in Miniland USA, trick-or-treating along the brick-or-treat trail, LEGO build activities, the largest LEGO Jack-O-Lantern in the world, Halloween entertainment and an all-kids costume contest with brick-tastic prizes! Christmas Bricktacular ( Weekends in December 2013 ) brings in the holiday season with a 30-foot tall LEGO Christmas tree made of 270,000 LEGO bricks, festive decorations, LEGO build activity stations, a LEGO Santa Scavenger Hunt and holiday entertainment. LEGO Santa and LEGO Toy Soldier make daily appearances in the park providing a perfect family photo opportunity. Countdown to Kids’ New Year’s Eve Party ( December 26-30, 2013 ) features nightly fireworks over Lake Eloise. Watch the spectacular fireworks explode into millions of tiny LEGO bricks with special viewing glasses. Kids’ New Year’s Eve ( December 31, 2013 ) is the perfect way to bring in the new year with the family where the giant LEGO brick drops at a very kid-friendly midnight KST (Kid Standard Time) – otherwise known as 6 p.m. EST. Other event elements include a spectacular fireworks show and a DJ dance party in Miniland USA.